On my daddy’s side of the family, the O’Brien’s, my Irish history can be traced to the early 1800’s. 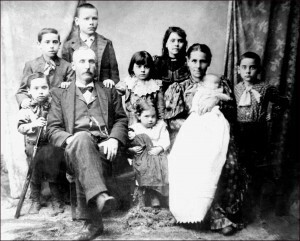 This family picture was taken about 1897 probably in Braidwood IL. My grandpa was Moses O’Brien, the dashing young man on the left holding the toy gun. The characters Gemma and Ben, my heroine and hero from Under Fire: The Admiral, shared an experience they had a few months ago while visiting Ireland. They were in the Irish countryside on a very dark, stormy night–really it was–in the middle of nowhere. They’d stopped at a local pub for dinner and were enjoying the food, pints, and conversation when the pub door slammed open. A soaking wet, obviously upset young man stood in the doorway. He rushed in babbling about a horrible experience. He was settled into a chair and given a pint. The beer was half-gone before he could string words into sentences and answer the many questions. The young man explained he was backpacking through Ireland and on a deserted road when it began raining so hard he could hardly see a few feet ahead of him. Finally, a car came slowly towards him and stopped. Desperate for shelter and thinking he was being offered a ride, he got in and closed the door only to realize there was nobody behind the wheel. Even though the engine wasn’t on, the car once again started moving. Ireland’s many ghost stories rumbled through his brain and fear paralyzed him. That is until he looked at the road ahead and saw a curve looming. Gathering courage, he prepared to jump. Then, through the driver’s window, a ghostly hand appeared out of gloom. In terror, he watched as the hand turned the wheel, guiding the car around the curve. The lights of the pub appeared and gathering strength, he jumped out of the car and ran for it. A silence enveloped the pub when everybody realized he was crying.